This Maheswari Cotton Silk saree has Deep Blue body with attractive Majentha outer borders and broad interwoven Zari Golden colored bands running along the body. Elegant sheer Blue body of the saree with two broad Zari Golden colored interwoven bands brings out the best of the matching border and graceful pallu. The attractive Majentha outer border perfectly contrasts with the Blue body colour of the saree. The pallu is an extension of the body itself with narrow strips in blue on Majentha band, and the interwoven Golden Zari colored border runs along the pallu with blue tassels at the end. 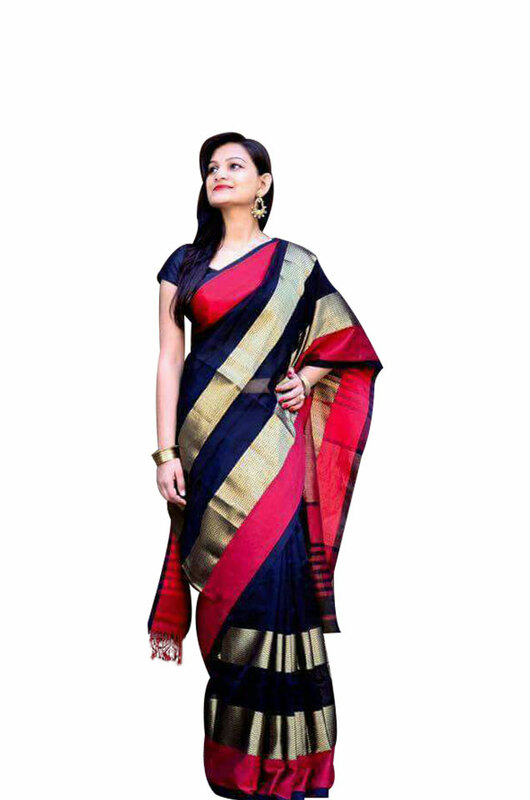 This saree has matching blouse piece in deep blue shade that is running along the saree. The Natural Cotton and Silk fabric and pure vegetable colors add a unique luster to this traditional saree. This elegant Blue colored saree with contrasting and yet suiting Zari Gold interwoven work and lustrous Pink borders along with a graceful pallu suits all occasions in your life.